The project team is wrapping up coordination with NPS on the proposed additional construction. Construction is expected to begin this Spring. Check back soon for more project details and schedule. 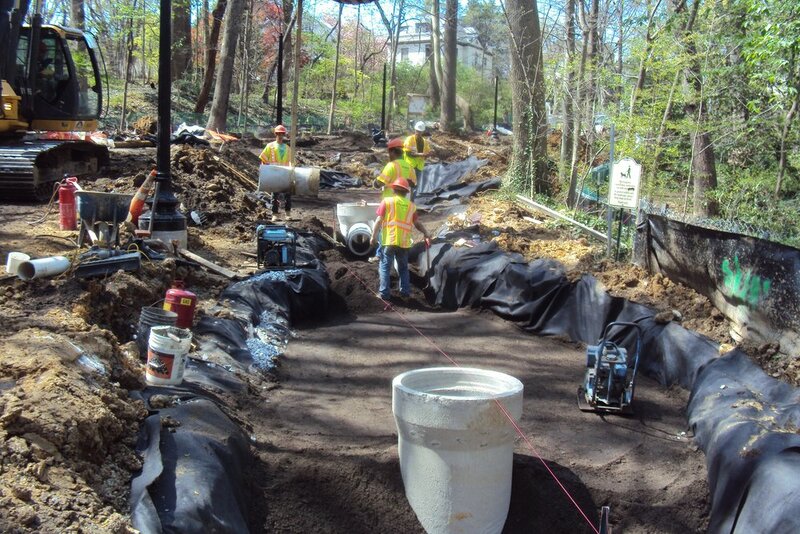 The DDOT team continues to coordinate the proposed upgrade of the stormwater sewer with the National Park Service. Construction that will require a full closure of the Klingle Valley Trail is still scheduled to begin in the near future. Please continue to visit this website as details of the construction schedule and trail closures will be available once dates are confirmed. Construction crews are getting ready to go back to work on the Klingle Valley Trail. 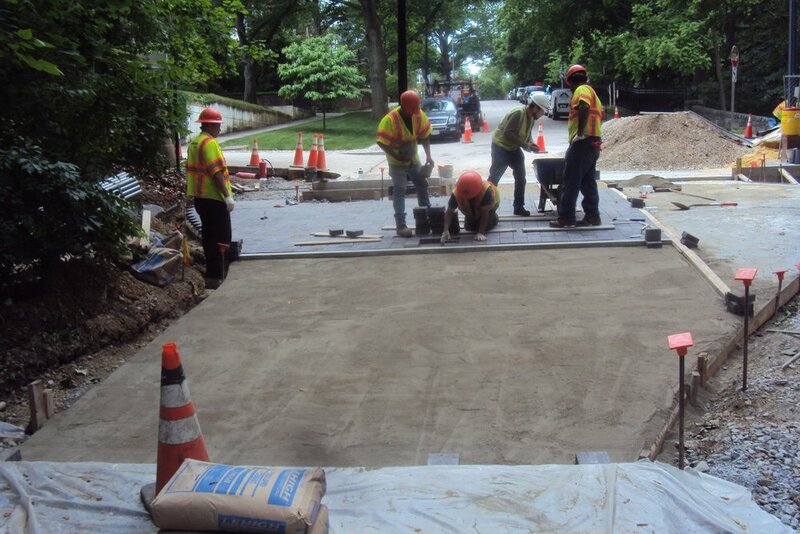 An existing DC Water stormwater sewer will be replaced to increase its capacity. This sewer has been the cause of some erosion issues during large rain events over the last year at the upper end of the trail. Additional erosion control measures will be implemented along the length of the trail. While upgrading the existing sewer, it will be necessary to close the trail for a portion of the construction as the excavation for the storm pipe and associated drainage structures will make the trail unsafe for users. Please check back for updates as work progresses. On Tuesday evening, DDOT representatives gave a brief presentation to the WPCA on the recent damage to the trail and took questions and comments regarding the upcoming repair plans. Click here to view the presentation. Join us this Saturday to open the Klingle Valley Trail. Construction crews are in the process of completing final landscaping and installing pavement markings on the trail in preparation for the opening. It's been a busy past couple of weeks, but the project has progressed to wrapping up the final construction items. 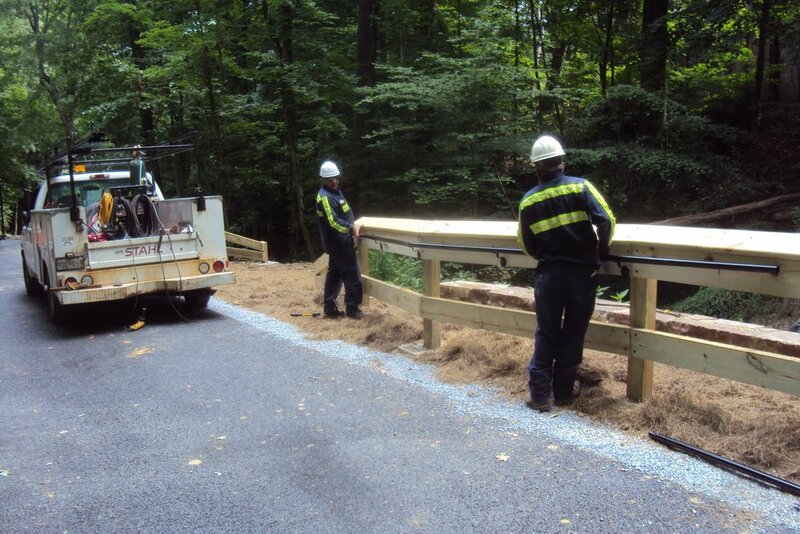 Crews are currently installing final landscaping, trail signage, and 13 park benches along the trail. Once delivered to the site trash receptacles and trailhead signs, providing an area map and history of the Klingle Valley, will be installed at each entrance. Stay tuned for more details on a ribbon cutting ceremony, as the trail looks to open very soon! Almost there! 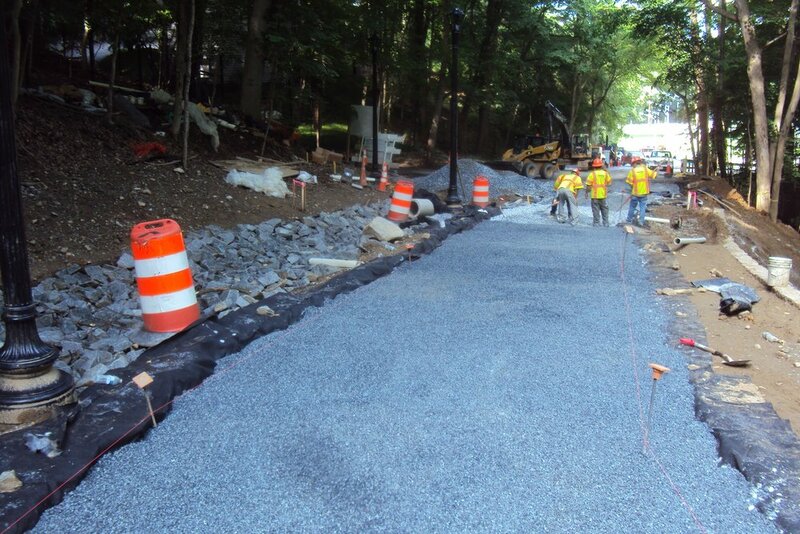 Last week crews completed installation of the porous asphalt trail connecting the two trailheads. The trail is comprised of 3" of base asphalt and a 1.5" of surface asphalt. Both lifts allow for stormwater to infiltrate the system and sit in a stone reservoir under the pavement. This week will be busy with construction activities including: mill & overlay on the east end of the project along Klingle Road, installation of wood fencing on the trail, final landscaping, reconstructing an existing curb cut on the west end of the project, installing signs throughout the trail, hardscaping at both trailheads, pavement striping along the trail, and completing the reconstruction of a historic stone headwall within the Tregaron Conservancy. Although the project is nearing completion, the trail is not yet suitable for public use. The project ask that the public refrains from entering the construction site until the opening. Check back with the website soon, as DDOT gets closer to confirming a date for the official opening of the Klingle Valley Trail. Asphalt paving operations began last week. 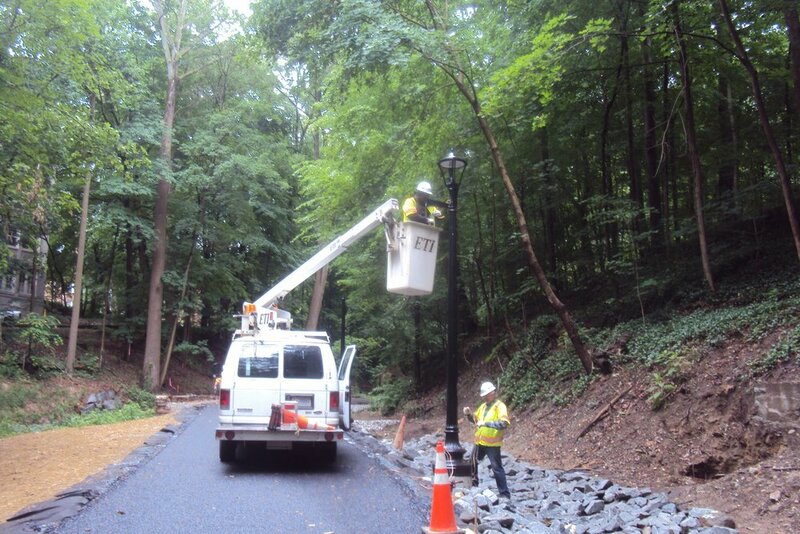 Field crews laid the base asphalt for approximately half of the trail from Courtland Place to the Connecticut Avenue bridge as well as the asphalt sidewalk connecting the Klingle Valley Trail to the Rock Creek Trail. The asphalt mix used for the trail is porous, allowing stormwater to drain into a stone reservoir while removing contaminants and sediment. While crews continue to make progress paving the trail, we ask that the public refrains from entering the construction site during all hours. Over the past two weeks, construction crews have completed four bioretention ponds near the west trailhead, installed wiring for the new LED lighting structures, and began grading of the trail itself. Final landscaping and paving operations are tentatively scheduled to begin next week, including an asphalt sidewalk on the east end of the project to tie Klingle Valley Trail into the Rock Creek Trail. 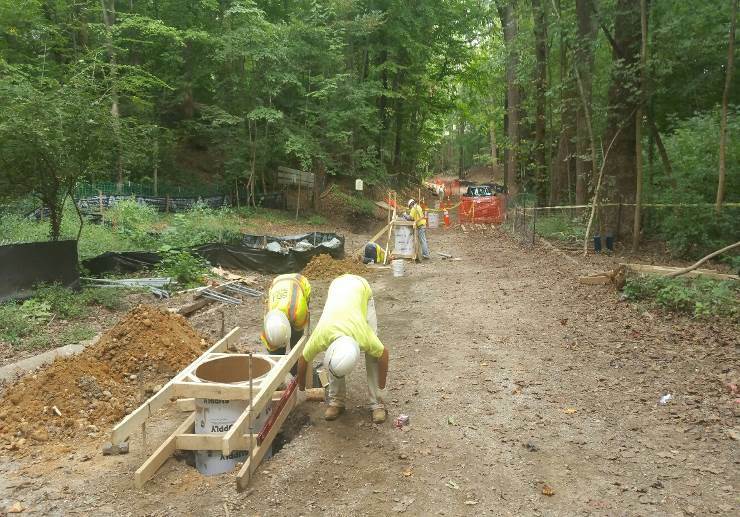 Prior to paving operations, crews must first complete additional work requested by DC Water on the existing sanitary sewers as well as access the adjacent Tregaron Conservancy property to reconstruct a historic stone headwall. Construction over the last couple of weeks has focused on some of the green infrastructure (GI) improvements on the project: the bioswale that runs along the north side of the trail and a biorentention ponds on the west end of the project. Both of these facilities are comprised of multiple layers of soil and porous stone to clean contaminants from stormwater and contain as much storm runoff on site as possible to prevent sediment erosion downstream. The project's electrical subcontractor has began installing necessary wiring running between newly installed manholes and lightpoles that will power the 52 LED lights on the trail. Additionally, staining of the East Retaining Wall is nearly complete. This is a retaining wall of nearly 500 CY of cast in place concrete using formliners to mimic the surrounding stone retaining walls. Activities for the remainder of April will focus on preparing for the final trail installation. Crews will perform final grading and placement of a porous stone base before laying down two layers of a permeable pavement. Paving is scheduled for late this month and the entire operation will extend into May. Although last Tuesday's snowstorm slowed construction progress last week, multiple field crews are completing some key operations this week. Progress on the rehabilitation of DC Water's sanitary sewers will soon be coming to a close. Crews have been able to take advantage of off-peak daytime lane closures on Connecticut Avenue in order to limit the number of nightshifts and disturbances to the public. Click here for the latest schedule of this work. Crews have also begun installation of the bioswale which runs along the north side of the trail. The purpose of the bioswale is to collect and retain stormwater runoff and remove containments through a matrix of different materials including bioretention soil (comprised of specified percentages of loam, sand, and organic compost), a sand and gravel choker layer, porous stone, and geotextile fabric. Just adjacent to the bioswale, all 52 light poles have been installed within the last 2 weeks. The electrical subcontractor began pulling cable through manholes and into the new light poles this week, as well as installing the LED light-post tops. The type of lighting for the trail was selected due to its dark-sky friendly qualities. Rehabilitation of the existing DC Water sanitary sewers in the area continues this week. This includes work activities during both daytime and nighttime depending on required traffic control. Click here for the latest schedule of this work. This work essentially provides a brand new pipe within the existing deteriorated sewer line by a method called cured-in-place-pipe. A polyester resin liner (the yellow material shown in the photos) is pulled through the existing sewer line and is then inverted within the existing pipe and cured with steam in place. A CCTV video inspection is performed both before and after to ensure proper installation. Work for the rehabilitation on the existing DC Water sanitary sewers is scheduled to begin Tuesday, February 21st. For the most current construction schedule for this work please click here. Work will begin on Klingle Rd, NW at Courtland Place during the dayshift. As this work progress onto Connecticut Avenue later in the week there will at time be a need for traffic control operations. In these cases, the work will be performed during nighttime hours. DC Water has issued a public information sheet that describes the work to be performed as well as their contacts for the rehabilitation project. Please note the sewer rehabilition work will be completed in early March not July as shown in the DC Water PIS. Over the past month, the entire length of the site has seen the installation of plenty of riprap (large stone used to slow the velocity of water and prevent erosion). Over 6000 square feet has been placed within a channel that will run on the north side of the trail. 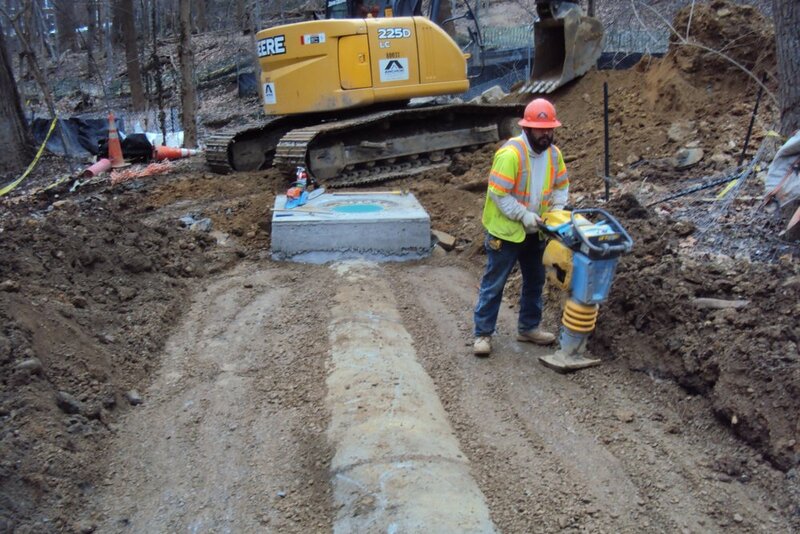 Construction has also progressed on another storm water element: elliptical concrete pipe and corresponding manholes have been installed close to the west entrance of the trail that will carry stormwater into the stream. Construction activities are currently on-going at the east end of the project along the ramp from Klingle Road to Beach Drive. 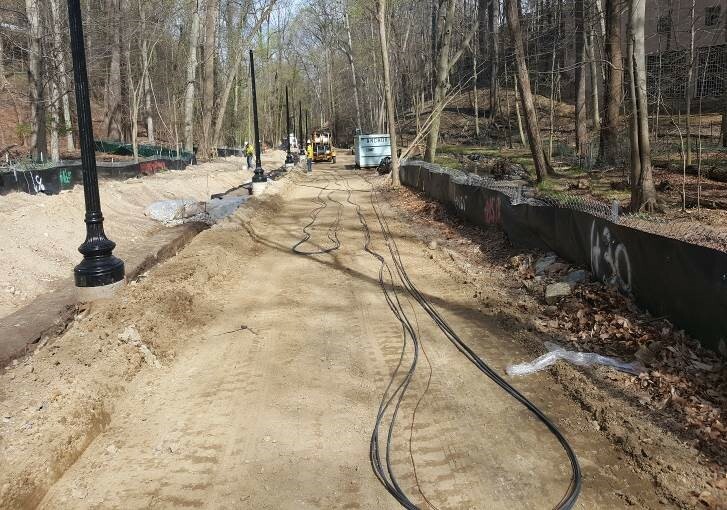 In order to allow for an asphalt sidewalk to connect the Klingle Valley Trail to the Rock Creek Trail, an existing retaining wall has been removed and will be replaced with a stone masonry wall that will match the stone work used for the adjacent bridge at Porter Street. Upcoming scheduled activities are focused on the rehabilitation of existing DC Water sanitary sewers within the project. This work will be performed by a method called 'cured in placed pipe' (CIPP) which allows a new liner to be installed within the existing pipe and does not require any significant amount of excavation to expose the pipe. The schedule for this work is being closely coordinated with DDOT and DC Water but will require some traffic control along Connecticut Avenue during off-peak hours. Construction crews utilize salvaged stone from within project limits to install a facade on the inside face of a newly placed concrete retaining wall adjacent to the stream. Happy 2017 from the Klingle Valley Trail Project! 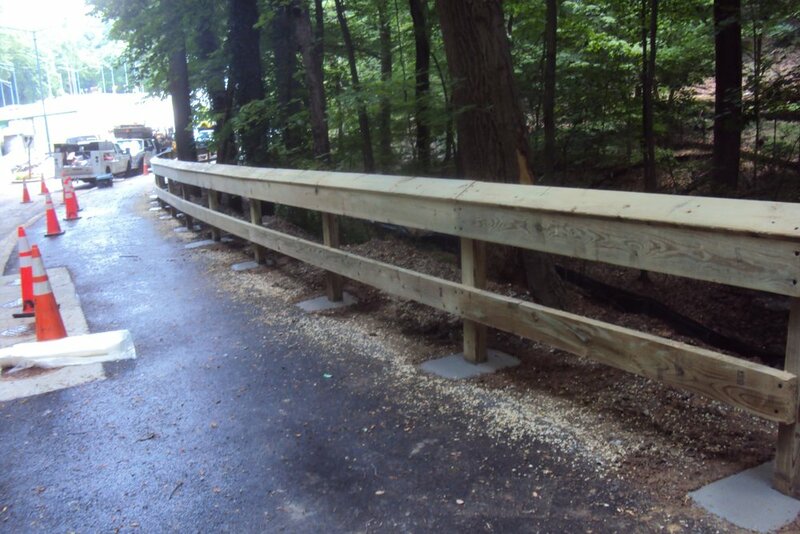 Recent construction activities have revolved largely around the various types of retaining walls on the trail. 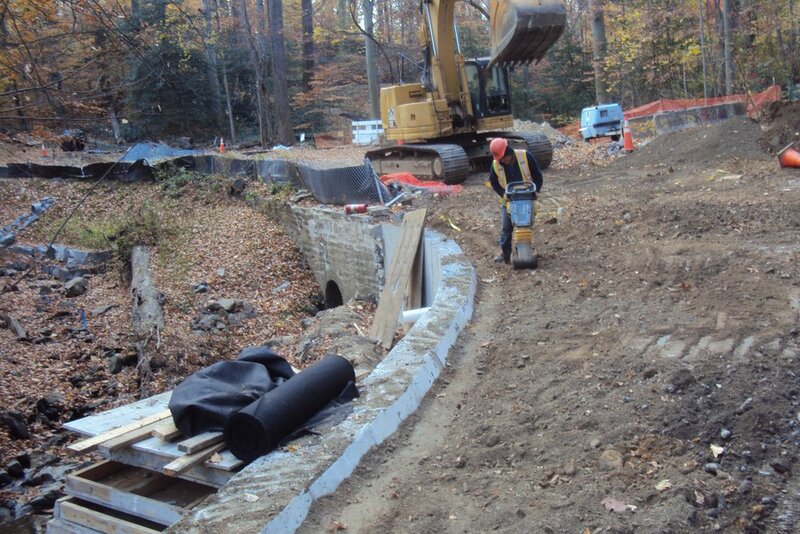 After completing the largest retaining wall on the project located on the east end of the trail, crews went right to work on constructing a smaller cast in place retaining wall with a stone and mortar facade located at the approximate mid-point of the trail (pictured above). Additionally, there are multiple existing walls throughout the project that will stay in place. Crews carefully replaced missing stones and mortar on these walls to enhance aesthetics and increase their service life. 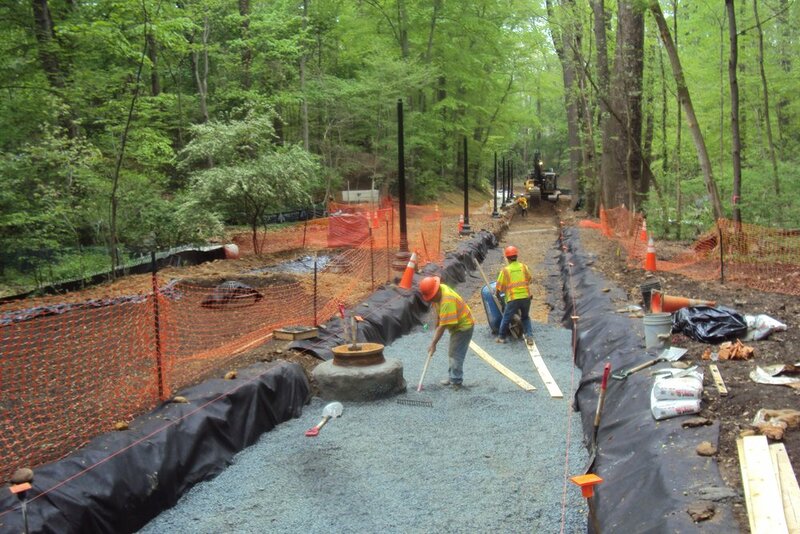 Other recent construction activities deal with the management of stormwater on the trail. New manholes and corresponding concrete storm pipe has been installed on the west end of the trail to assist with carrying excess stormwater from the north side of the trail into the stream. Crews have also begun the construction of riprap ditches that run on the north side of the trail. These riprap ditches contain large stones that, in concert with a bioswale, with help to slow the velocity of excess stormwater run-off and allow it to be absorbed locally rather than overwhelming the stream. Construction continues to progress on installation of electrical infrastructure required for over 50 new LED lighting structures. Crews have installed new manholes and are in the process of completing installation of underground conduit that will house the cables and wiring for the lights. Crews have also removed all formwork from the large gravity retaining wall on the east end of the project. It is currently being capped with existing salvaged stone and (weather dependent) is ready for the front concrete face to be stained to match the existing stone. Additionally, a smaller retaining wall has been recently completely at about the midpoint of the trail along the stream. This wall was constructed with cast-in-place concrete but will also receive a façade using the existing salvaged stone. Construction crews continue work on the East Retaining Wall; removing formwork and backfilling the concrete wall in preparation of staining the concrete "stones" to match that of existing material in the area. The backfill activity is a timely operation. Crews install 8" layers of two different types of material: one to provide structural support and another to allow the wall to be relieved of pressures from accumulating water. Each layer is mechanical compacted and then test to ensure proper density is achieved. The operation also includes the installation of waterproofing material so that stormwater does not seep provided joints in the wall. Compaction of backfill behind the gravity wall. Construction has also begun on a much smaller retaining wall on the east side of the project along the ramp to Beach Drive. The existing retaining wall is not structural sound and therefore will be removed and replaced. The replacement retaining wall will utilize existing, salvaged stone from the project. Removal of existing damaged retaining wall. Existing stone to be salvaged and used on the project. Construction crews continue to take advantage of the favorable weather on site and completed all concrete placements of the gravity retaining wall on the east end of the project. Additionally, all foundations for the trail's light poles are now installed in the ground (a total of 52!). Upcoming scheduled activities include installing the electrical manholes and conduits that will power the new pole's LED luminaires. Rainy weather conditions have closed out the month of September on the project. The newly installed step-pools within the stream helped to increase the time stormwater runoff is retained on-site as well as slow the velocity of the stormwater. Although the wet weather has slowed construction activities the last few days, progress was made this month on the new retaining wall on the east side of the project. There is one concrete placement for the wall remaining. Once completed and cured, crews will stain the wall a reddish-brown color to mimic the salvaged storm utilized elsewhere in the project. Form work was removed from some of the first sections of the wall placed, revealing the stone and masonry pattern of the newly placed wall. Additionally, work began on the new lighting structures for the trail. Construction crews installed over half of the foundations for the new light poles. Once the foundations are all in the ground, conduit and wire will be trenched underground for future powering of the lights. 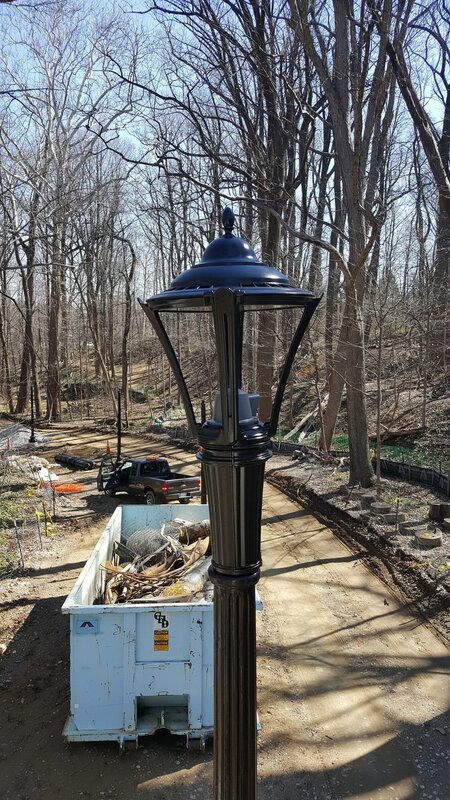 The new light poles are cast iron with a Phillips MetroScape fixture and an LED lighting source. (Washington, DC) The District Department of Transportation(DDOT) invites you to a public meeting to present project schedule updates and information regarding the upcoming trail construction phase of the Klingle Valley Trail Project. If you need special accommodations, please contact Cesar Barreto at (202) 671-2829 or Cesar.Barreto@dc.gov five days in advance of the meeting. If you need language assistance services (translation or interpretation), please contact Karen Randolph at (202) 671-2620 or Karen.Randolph@dc.gov five days in advance of the meeting. These services will be provided free of charge.